After the way their season ended in January, there might not be a team more fired up to play meaningful football than the Dallas Cowboys (except maybe the Lions and Packers). With the loss of running back DeMarco Murray, cornerback Orlando Scandrick's injury and Tony Romo's age, there's just enough uncertainty among fans and media to make them question the team's 2015 outlook. Playing the New York Giants at home, should help assuage some concern. Many expect the Cowboys' rushing attack to take a step back in 2015, so this is possibly the No. 1 key to the team's success this season. It was, after all, the key to Romo's efficiency, the defense's "improvement" and the team's leap forward in general. Sunday night's game might not be a good barometer, though, as they're facing a Giants' defense that stopped the run about as well as a rusty gate in 2014. Opposing runners gained 4.9 yards per carry against the Giants last season, which basically means the average team was more productive rushing team than the Cowboys (4.6 yards per carry). At Alabama, Landon Collins looked like a he'd grow into a quality strong safety. He also looked like he'd need some time to develop into that and he's still the Giants' best safety. That will put a lot of pressure on cornerbacks Dominique Rodgers-Cromartie and Prince Amukamara to cover wide receivers Dez Bryant and Terrance Williams. They're not up to that challenge and Tony Romo will have at least a handful of deep opportunities, which he'll hit as long as he doesn't look like he did in last year's opener. Losing slot corner Orlando Scandrick for the season is going to hurt the Cowboys quite a bit, especially against teams that have dynamic slot receivers or like to run out of 3-receiver sets. The Giants typically fall into the first category, but Victor Cruz's injury mitigates the loss of Scandrick. Without Cruz, the Cowboys can use a nickel front of Randy Gregory, DeMarcus Lawrence and the Crawfords (Jack and Tyrone) to make life miserable for Eli Manning in the backfield. Add in the finger injury that has sidelined defensive end Jason Pierre-Paul for a month, and the Giants are missing possibly their key player to defeating the Cowboys on both sides of the ball. At full strength, the Giants could pose a threat to starting the Cowboys' season off on the wrong foot. They're not, though. 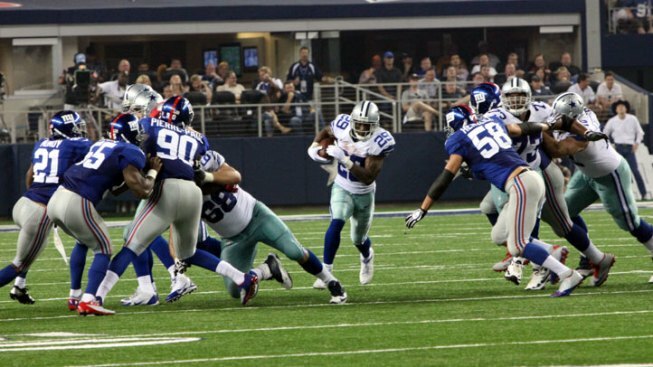 Cowboys fans should look forward to a 10-point victory to finish off NFL's opening weekend.